(1) Top FBI and DOJ officials have asked House Republicans and the president not to "release the memo." Both FBI Director Christopher Wray (last heard from forcing ex-Deputy Director Andrew McCabe out over yet-undisclosed Inspector General findings about the Bureau's Hillary probe), and Deputy Attorney General Rod Rosenstein (who appointed Mueller and is overseeing the special counsel investigation) say the memorandum written by Republicans on the House Intelligence Committee paints an inaccurate picture of the relevant issues and makes crucial "material omissions." This echoes the complaints of Democrats, who have written their own counter-memo, the public release of which the GOP contingent of the committee voted down on Monday. But other senior law enforcement sources have told other reporters that the Republican document does not contain any factually false information. I've said it several times at this point, but it's worth repeating: Let's see both partisan memos, along with as much of the (redacted) underlying intelligence as possible. This selective game of telephone is getting exhausting. 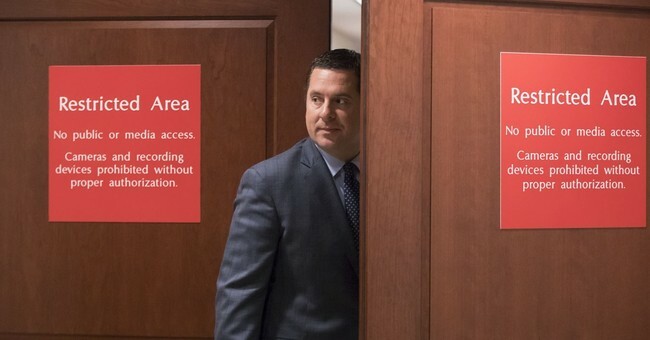 Also, this may sound like hackery to some on the Left, but consider it anyway: How is the House GOP's desire to release details they find important or helpful to their interests materially different from any pieces of the nonstop leak-fest we've witnessed over the past year? Virtually all of the information over which the media has obsessed has been partial, cherry-picked, and released (often via unnamed sources) in furtherance of some sort of agenda. Republicans are at least being relatively transparent about what they're doing here, and are pursuing their "leak" through proper and official channels. So there's one material difference. As I said above, they should also authorize the release of the Democrats' memo, so we can judge the information's credibility, based on more information and context. And by the way, does anyone believe the Democrats' memo won't leak in very short order anyway? Rosenstein is a political appointee. The president asking if he is "on my team" is not exactly an indictable offense here. What did Eric Holder say about Obama again? "I'm still the president's wingman"? For what it's worth, the memo will likely be in the public domain very soon. (4) Peter Strzok reportedly had a hand in FBI Director James Comey's call to formally notify Congress that the Bureau was re-opening the Clinton investigation in late October of 2016. Strzok is the FBI agent removed from the Russia probe after Mueller discovered election-era anti-Trump text messages he exchanged with his paramour, a fellow member of the team -- including a cryptic reference to an "insurance policy" in case Trump won. Comey's October decision was made, you'll recall, in connection to a trove of relevant emails discovered on the unsecure laptop of top Clinton aide Huma Abedin's estranged husband, former Congressman Anthony Weiner. Comey's letter to Congress sent shockwaves through Washington, and many Democrats believe it cost Clinton the election, even though (a) it was a defensible decision, and (b) Comey wrapped up the new phase of the investigation quickly and reasserted his questionable decision not to recommend charges prior to election day. Side note: It's the FBI's internal actions surrounding the Weiner laptop emails that is apparently the basis for the ouster of McCabe, pointing to possible damaging information uncovered by the nonpartisan Inspector General's office, which is conducting an investigation into the Bureau's Clinton investigation (got all that?). If Strzok helped launch arguably the deadliest anti-Hillary missile of the entire campaign, that would at least partially suggest that he was able to carry out investigative duties that conflicted with his personal partisanship. Yes, the CNN story details that he was 'conflicted' about having done so, and this development doesn't erase his suspicious texts or his role in sanitizing Comey's July 2016 exoneration statement. And yes, we know this information was leaked by someone with an agenda, if not Strzok himself. But it still seems relevant, if true. Take literally everything written in "Fire and Fury" with a large chunk of salt (the first tweet there is based on NYT reporting), but one of the few elements on which Michael Wolff seems to actually have the goods is quotes from Steve Bannon. Nevertheless, this is all a snapshot at this stage, and we don't know exactly what any of it means -- but I do know this: If the party roles were reversed, you'd better believe conservatives would be loudly declaring 'those emails will never get out' to be a five-alarm cover-up. And by the way, said emails dealt with this infamous encounter at Trump Tower, which remains the strongest whiff of real or attempted collusion that we've seen over the course of this whole saga. People are making that point that Hicks is likely the keeper of many secrets, and if Mueller has her in a vise, some high-level people may be sweating bullets. That sounds right to me.